She was Alex's favorite pillow. How am I supposed to explain death to my two-year-old? This morning, I had to put my beloved cat, Orangina, to sleep. The scrappy little stray who stole my heart many moons ago in Burlington, Vermont–before I met my husband or kids–lost the fire in her eyes. She was a cat who refused to budge from my back porch, camping out on a rain-soaked chair covered with fallen leaves after a bad storm, compelling me to give her a home. Verbal, animated, and often a little too frisky, she was always up for a fight. I opened my door, and she walked right through it with no fear, knowing she found her Mom. 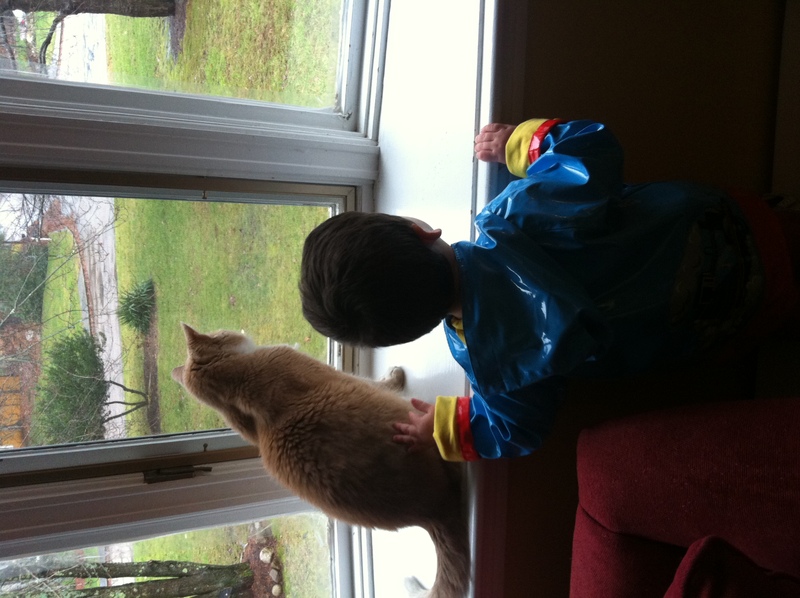 Alex and Orangina looking out our bow window, in happier, healthier times. When I placed her in her cat carrier, I knew with every fiber of my being that she wouldn’t be coming back home. 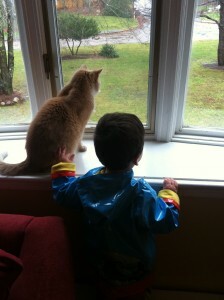 In a way, I think Alex sensed it, too, because he climbed up and sat in our bow window sill with Orangina this morning. And, today, he closed the curtain. 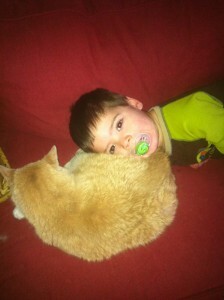 He said, “No Mommy!” when I wanted to move him, and, for the first time in a week, I heard my kitty purr softly. I let them have their moment, grateful that my rambunctious little boy is also incredibly intuitive, sensitive, and loving. He knew. And he cried when I left with her to take her to the vet. Funny, I was so nervous when Alex was born. Orangina was a little old lady by then, but she still had lots of vim and vigor, and would swipe if you rubbed her the wrong way. You can take a girl off the streets, but can’t take the streets out of the girl. But she surprised all of us, tapping into restraint we didn’t know she had when it came to Alex. 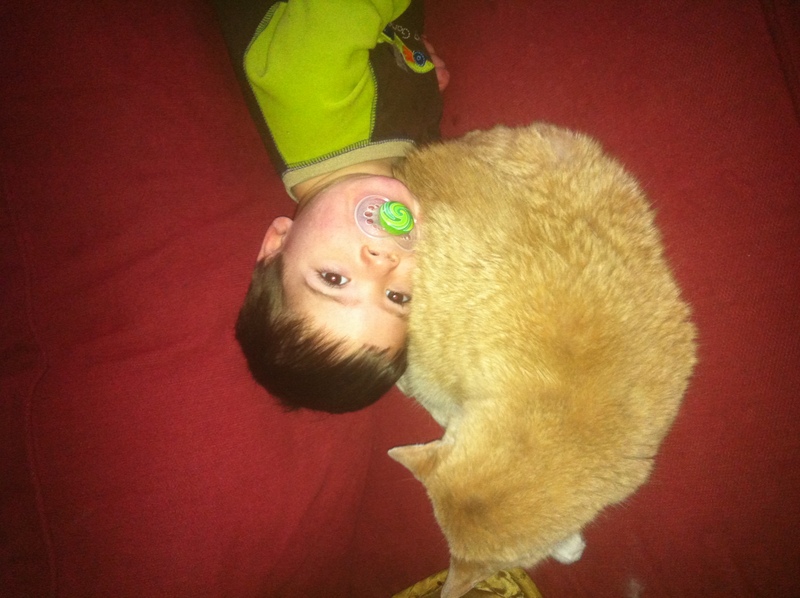 My son draped himself all over her, laid on her stomach, pulled her tail–and she took it. Time after time after time. Like Alex, she was such a kind, sweet, and instinctual little thing. She knew he was just a baby, and defended herself only once (I was mad about it, but I understood why). 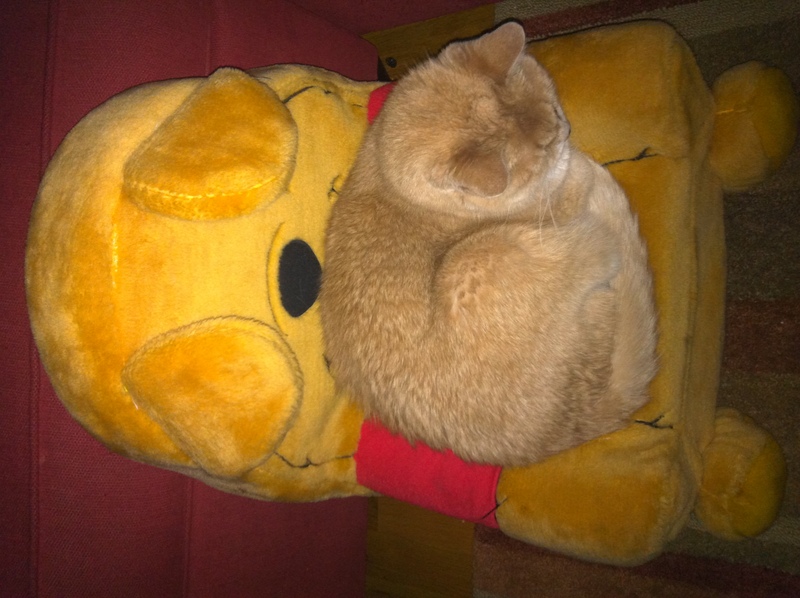 Saying goodbye to a pet who has hogged half of my pillow every night for more than a dozen years is heartwrenching. Sure, she drove us crazy when she woke us up before the baby for a nasty-smelling can of Fancy Feast, but my husband and I let her sleep with us regardless. 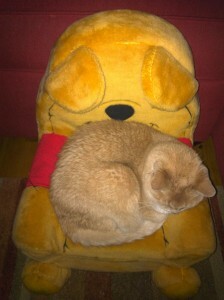 We knew she was gravely ill when she stopped jumping up on our bed at night, as that was her favorite time of the day. She purred so loud that it was initially hard for Scott to get to sleep, but it soon turned into a lullaby for him, too. My husband wasn’t “a cat person” when we met, but she transformed him. He brushed her every day, affectionately nicknamed her “Chickie” (an abbreviated version of “orange chicken,” his first term of endearment), and looked for her when he got home from work. Ashley also loved Orangina dearly, and let her cuddle up next to her on her bed, even though she would shed ridiculous amounts of fur on her new comforter (true devotion for a teenager!). There was just something about her that we will never forget. Orangina loved all of Alex's pint-sized furniture. He always let her curl up on his stuff. When I returned from the vet empty-handed and broken-hearted, with puffy, tear-smeared eyes and a fake smile on my face (for Alex’s benefit–though he is literally a part of me, and saw right through me), my son asked, “Where’s Kitty?” Scott replied, “At the doctor’s,” which is true–for now. Alex, with hope in his eyes, said, “Check up?” and my heart fell to the floor. No, honey, she’s checked out of this world, and I don’t know how to tell you, to make you understand. Have any of you lost a pet member of the family when your child was so young? If so, how did you explain it to him/her? Losing a pet is so hard. I’m so sorry. You made me cry! Beautiful tribute. Sorry for your loss. They really do become members of your family. 🙁 I’m just getting caught up on mommy dish and saw this news. Heartbreaking, I’m so sorry. Makes me so sad to think of Alex’s reaction. Sniff.